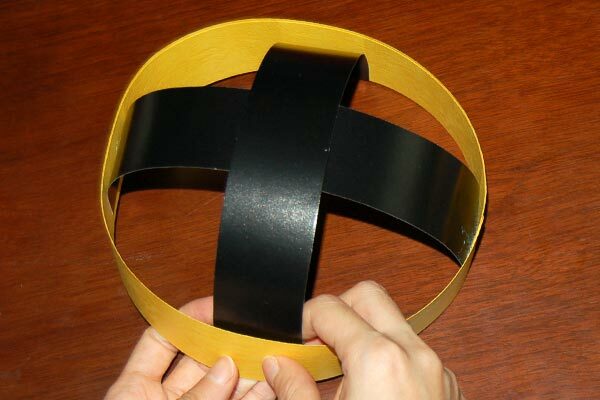 Recreate the majesty of the kings and queens of medieval Europe with this wearable crown craft made out of strips of construction paper. 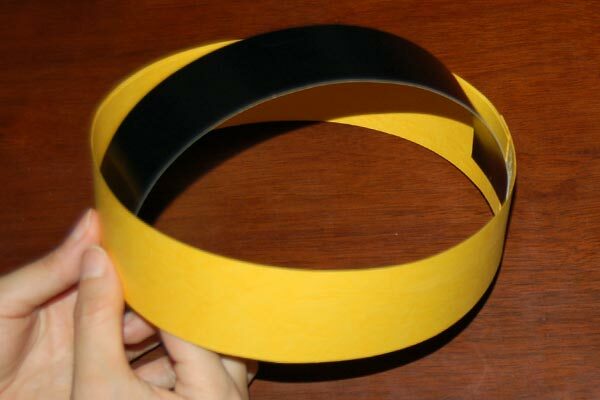 1Cut a strip of construction paper. 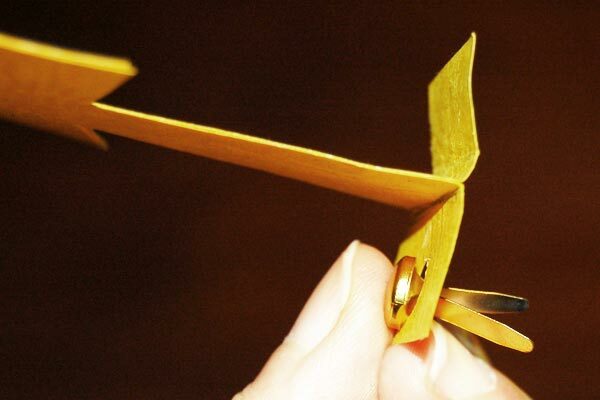 Cut out a 1½ to 2-inch wide strip of yellow or gold construction paper long enough to go around your head. 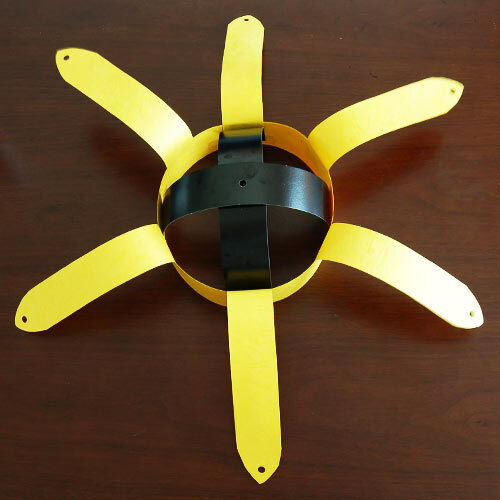 This piece will be the crown's base so the construction paper should be thick or heavyweight for a sturdy crown. 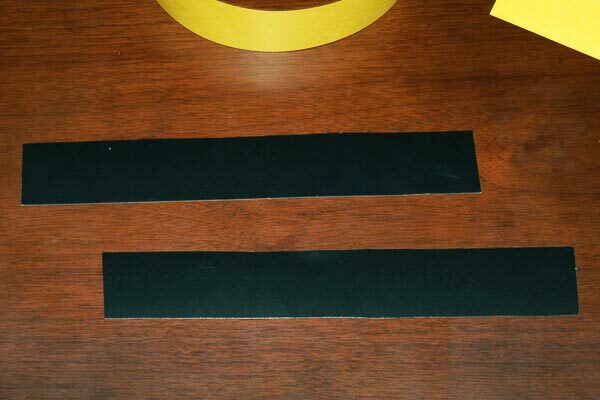 3Cut two black paper strips. 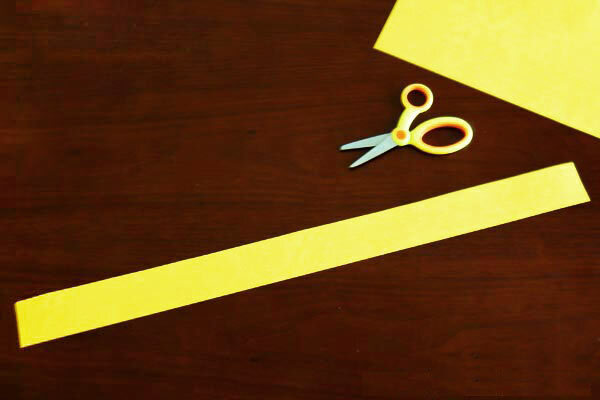 Cut out a pair of 1½" x 10" strips of black or brown construction paper (or a color that best blends with your hair color). 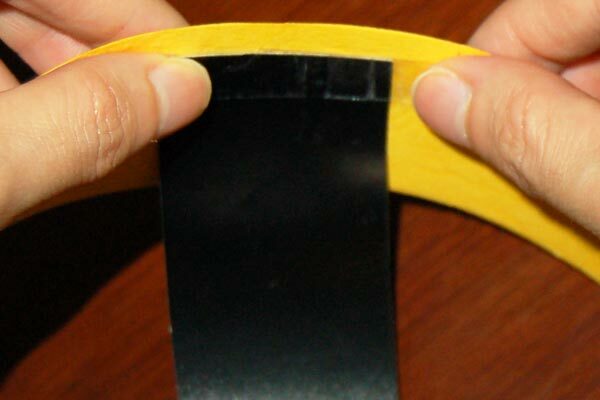 6Tape the paper strips at the base. 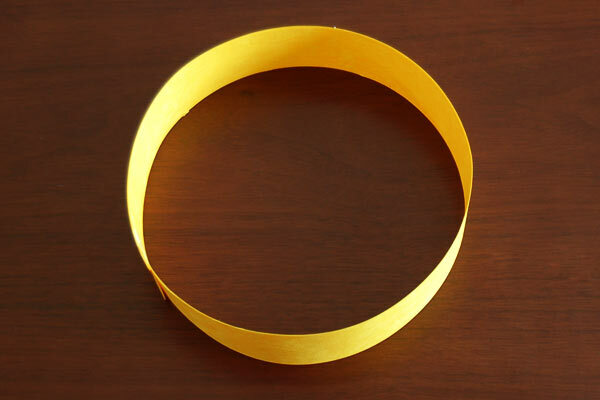 7Cut six yellow paper strips. 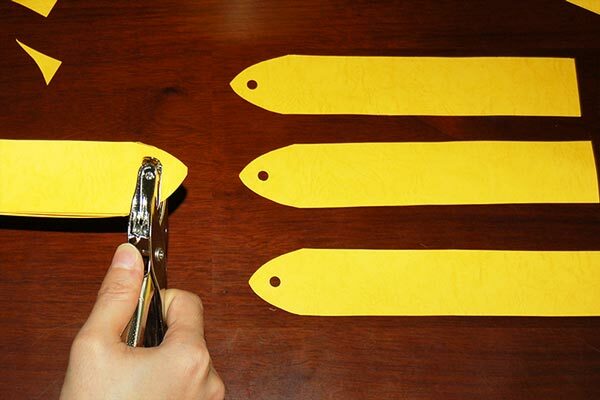 Cut out six 1½" x 8" strips of yellow or gold construction paper. 8Curve out the tip and punch a hole. 9Punch a hole at the center. 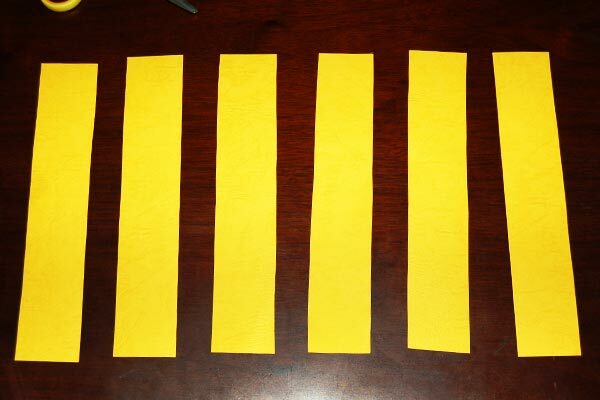 10Glue the six yellow strips. 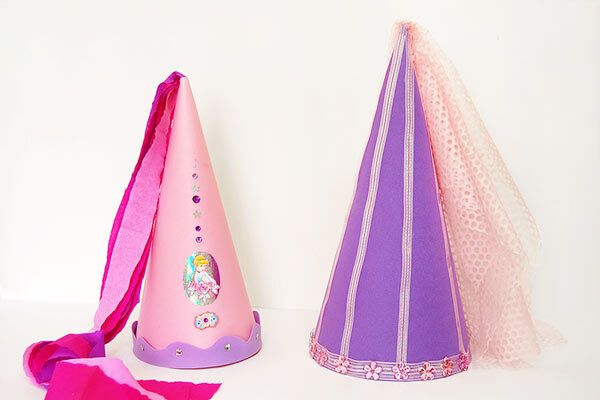 11Create a crepe paper liner. 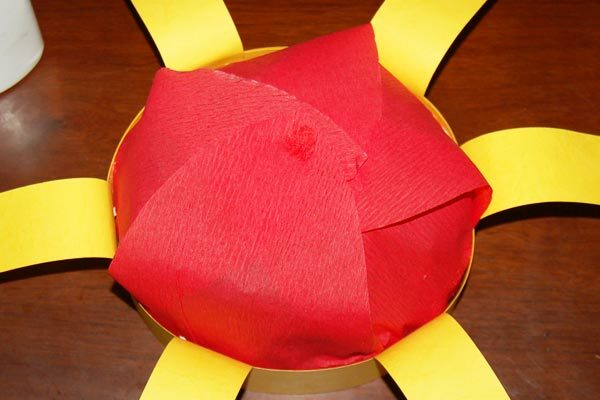 If you want to create a lining for your crown similar to the fabric lining of a real royal crown, cut out a couple of half-petal or hill shapes from red crepe paper. 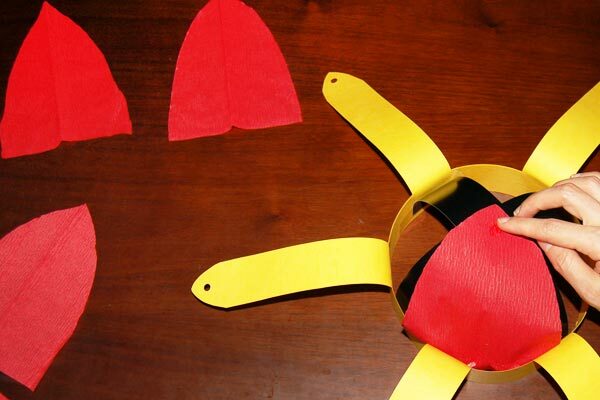 Glue the bottom of these crepe paper shapes along the inside of the crown's base. 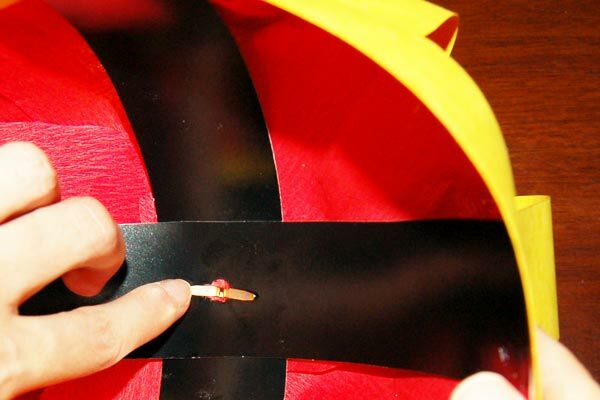 Glue the tips of the crepe paper onto the center of the crown supports. If you prefer not to have this lining, skip Steps 11 and 12. 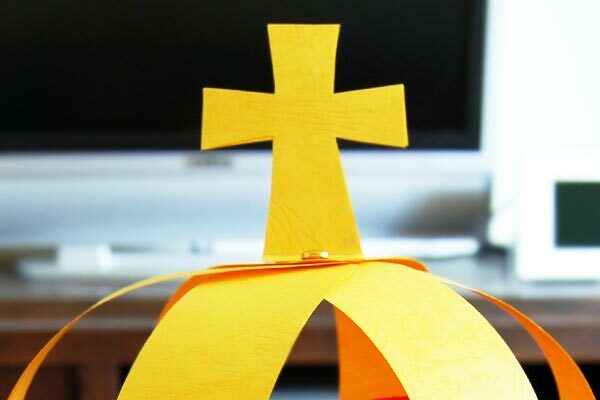 Create a cross crown topper by cutting out a pair of identical crosses from yellow or gold construction paper. Include a tab or rectangular extention at the base of each cross. Crease along the bottom tab. Glue the crosses together except at the bottom tabs. The crosses should be aligned at the edges. Fold out the bottom tabs. 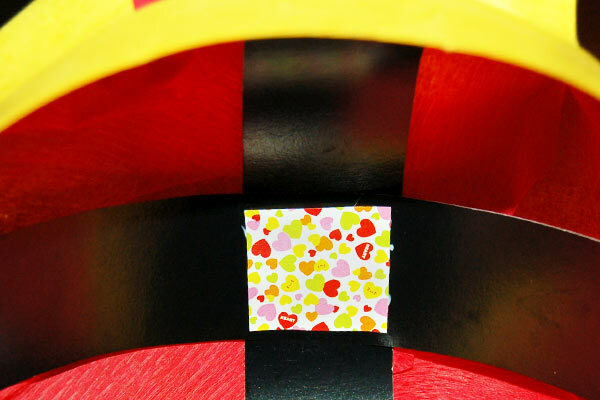 Punch a hole at the center of one bottom tab and insert a round head paper fastener. 15Connect the topper to a strip. 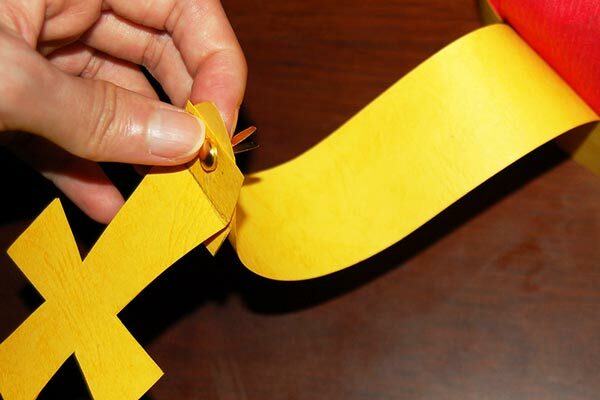 Connect the crown topper to one of the six yellow strips by inserting the ends of the fastener through the hole at the tip of the paper strip. 16Gather all strips under the topper. 17Fix the topper in place. 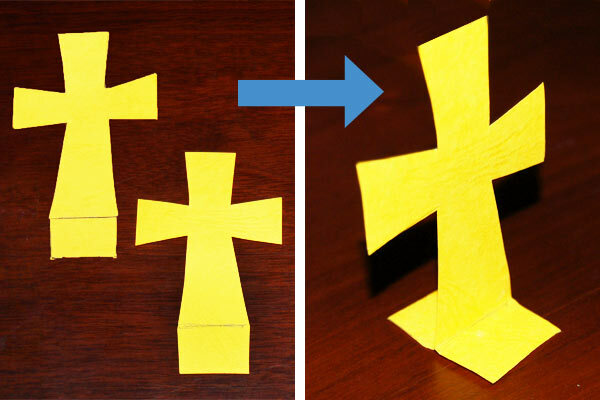 Fix the cross to the center of the crown by inserting the ends of the paper fastener through the center holes on the supports, easily puncturing the crepe paper cover. Split the ends of the fastener from the inside of the crown. 18Cover the ends of the fastener. 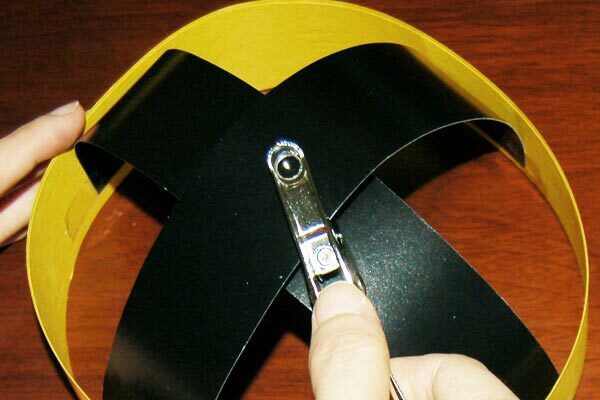 For safety, cover the ends of the paper fastener with tape or with a small piece of paper. 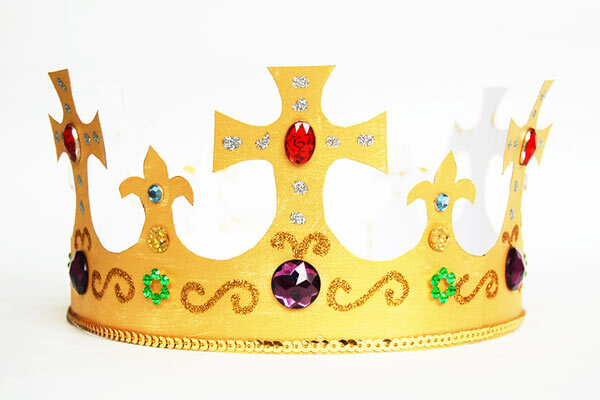 Decorate your crown with sequins, rhinestones, plastic gems, gem-style stickers, beads, glitter glue, puffy paint, bits of tinsel paper, and other notions. 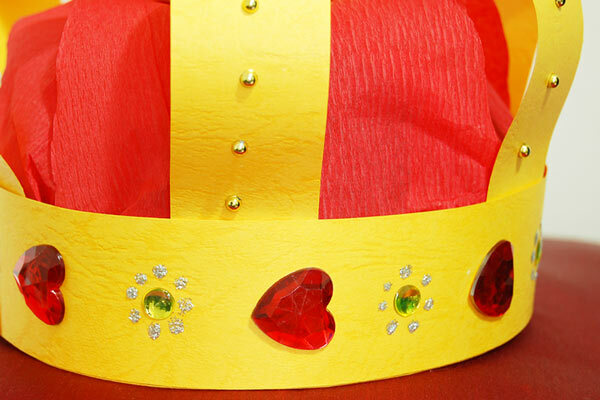 Once the glue dries, try on your awesome royal crown! 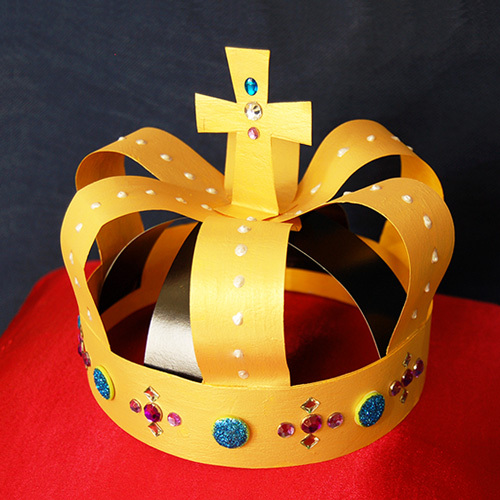 If you want a painted crown, use white construction paper instead of yellow or gold construction paper. 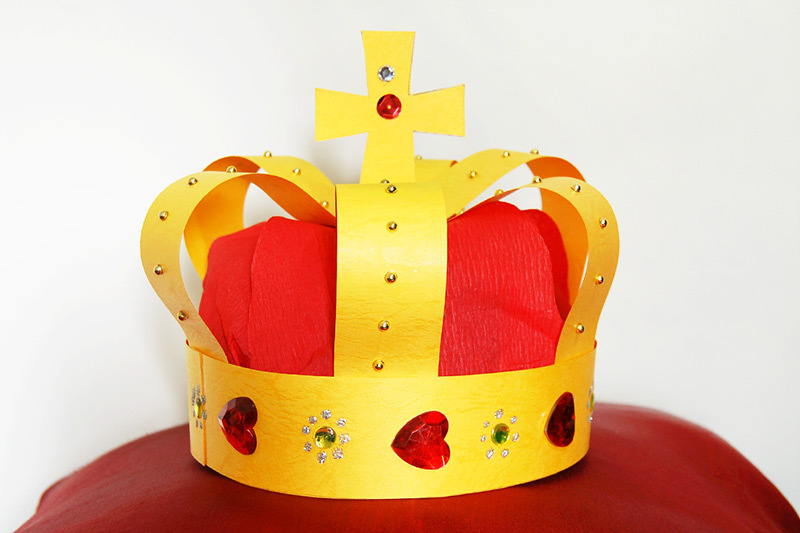 Paint the entire crown using tempera or acrylic paint after Step 18. 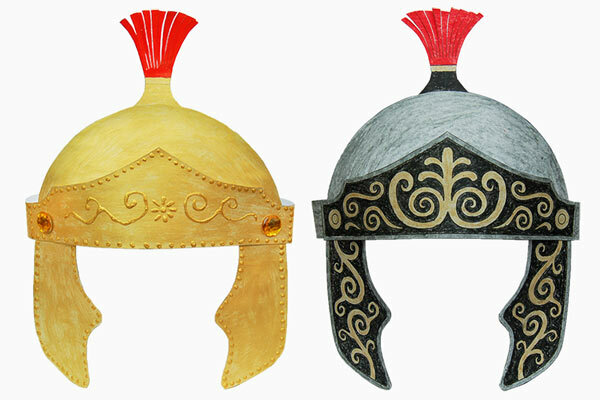 Let the paint dry before decorating your crown.